There has been a growth in recent years in precarious work in Asia, as in the world generally. By “precarious work” we refer generally to work that is insecure and uncertain and in which workers bear the risks and receive limited social benefits and protections. The expansion of precarious work in the industrialized countries of East Asia (such as Japan, South Korea and Taiwan) reflects a departure from more stable and permanent work patterns that accompanied their transition to “modern” industrial jobs. In the countries of South and Southeast Asia (such as Indonesia, the Philippines and Sri Lanka), work has always been precarious given the pervasiveness of the informal economy in these countries and so the persistence and expansion of precarious work and the informal economy did not generally involve a wholesale transformation of previous patterns, though here too the expansion of formal industrial and service sector jobs have been accompanied by extensive uncertain, unstable and insecure employment practices. Precarious work has pervasive consequences not only for the nature of work, workplaces, and peoples’ work experiences, but is a social, economic and political concern that speaks to the ability of people to raise families and to manage their everyday lives. It thus has far-reaching costs that cut across many salient topics to social scientists, as well as to workers and their families, governments, and businesses, such poor welfare and housing and economic insecurity, among other things. The costs associated with the spread of precarious work in Asia have led to a range of responses on the part of workers and governments. While market reforms and the growth of precarious work have decreased the power of workers in pushing for progressive social policies, there are signs of growing worker resistance and trade union activism in some Asian countries to the spread of precarious work and economic inequality or at least to mitigate some of their more negative consequences. The growth of precarious work has thus become an increasingly urgent issue in many countries that has generated strong pressures for governments in Asia (as in the rest of the world) to “do something” to reduce social and economic distress. Existing welfare regimes based on a model of relatively stable work are no longer adequate in light of the emergence of precarious work as the dominant feature of the social relations between employers and workers in the contemporary world. This has created pressures to extend social protections to help people who do not have stable work to manage the new risk structures as well as to revise labor laws and enact new ones that may help to regulate precarious work. The responses to precarious work underscore the political nature of economic restructuring and social welfare. The nature of political response depends on the context: in many European countries, for example, responses to precarious work may occur with the assumption that the state will manage the transitions and social impacts; by contrast, for the political and economic elites of East and Southeast Asia, the threat of social unrest has required different political responses and elites may want to calm unrest that is generated by capitalism’s competitive transformation and maintain order in society through electoral populism or social welfare expansion. 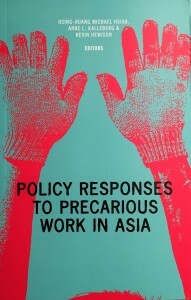 The chapters in this volume illustrate some of the responses to the growth of precarious work in diverse Asian countries. All the countries represented here have experienced increases in precarious work in recent years, which has had wide-ranging effects, both related to work and non-work aspects of social, political and economic life. In all countries, there has been reaction against the growth of precarious work, ranging from union activism to various types of social movements. The responses of governments in these countries have also been varied, both in terms of types and degree of change. Taken as a whole, the chapters in this book provide an assessment of the current state of research and policy discussions on a vital aspect of the political economy of work that is likely to take on increased importance in the 21st century.